Uncategorized | This Is Finda! 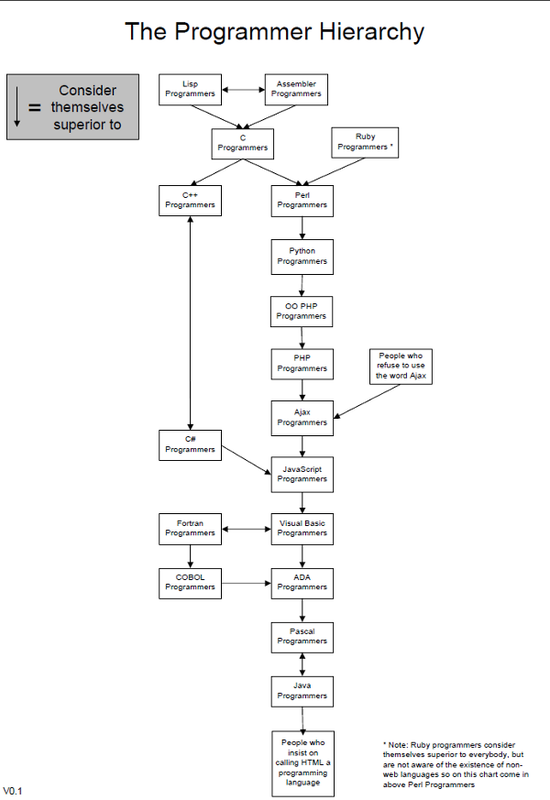 Of course, since I can fling a bit of assembler around when I need to, I obviously agree with this chart (…mostly). I think every programmer should be forced to learn assembler when they start out, so that they properly appreciate how a computer actually works… and to scare off the wannabe programmers who shouldn’t really be in the job in the first place. I’ve never really tried to learn Lisp though I’ve considered it a couple of times. The one thing that puts me off is that any programming language that uses more parenthesis than actual code can’t be a proper programming language. Also, Ruby? I have one thing to say about that: Python > Ruby. That is all.